The PETA Vegan Food Awards took place this September, highlighting the very best in plant-based food, drink, supermarket ranges, and of course, chocolate. Now in their sixth year, the awards celebrate the most the most delicious and innovative new products for vegans. The great thing about these vegan food awards is that, not only do they honour and award those in the industry who are working to provide new and often ground-breaking products, but that it offers a snapshot of what is current and relevant in a dynamic market. 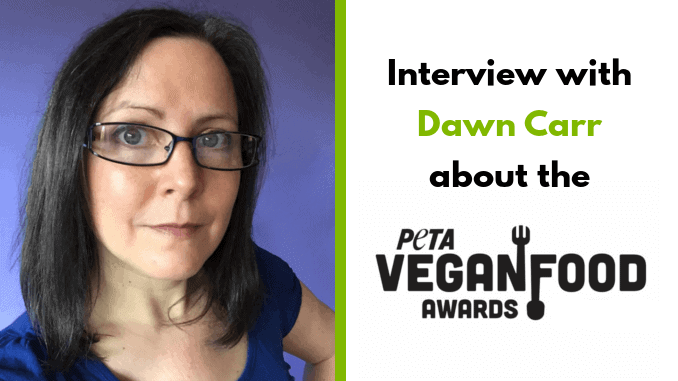 We were honoured to speak with Dawn Carr, Director of Vegan Projects at PETA UK, about the exciting 2018 awards and about the growing trends in the plant-based world. The market for vegan food has seen explosive growth over the past six years, and this shows no signs of stopping. From high end to the high street, restaurants and retailers are cashing in on the growing demand for cruelty-free food. Your webpage for the awards quotes that veganism is the fastest growing lifestyle movement, with an increase of 700% in 2 years. In your opinion, what is happening to influence and drive this growth? We’ve learned so much about animals – and the more we know about them, the harder it is to justify killing them for a burger. In the past, we had to go to the library to look up information about animal agriculture, but now, it’s all at our fingertips online. The rise of social media has allowed animal-protection groups such as PETA to reach millions of people in a matter of minutes – and to give the public a glimpse inside factory farms and abattoirs. Once people see the routine abuse to which pigs, cows, chickens, sheep, and other animals who are raised and killed for their flesh are subjected, many vow never to support the meat industry again – and then they share the content and urge their friends and family to join them. Your page also says, “Countless savvy businesses are embracing plant-based eating by creating exciting (and tasty) food for all” – would you say that we’re soon coming to a point where food manufacturers and restaurants absolutely need to accept plant-based living and adapt to these changes to survive as businesses? Absolutely. And in the space of a week, we’ve seen two great examples of this in the news – one of a business being left behind because of its unwillingness to adapt and the other of a business embracing the future of food and thriving. AJ Goddard pie shop in London has blamed its ill fortunes and impending closure on the rise of vegan eating, while Sutton and Sons – a chain of traditional fish and chip shops also in the capital – has seen such success with its vegan options that it’s now converting one of its locations to an all-vegan menu. You have several categories for the awards including vegan meat, non-dairy milks, vegan cheese, desserts, and burgers etc. Which category has been the most difficult to assess and judge, and why? The Best Vegan Burger and Best Vegan Menu categories were probably the hardest, since we had so many exciting new options to choose from. In which category have you seen the most growth and/or change? This would probably be the Best Vegan Menu category, as there are now countless chains that offer impressive vegan menus instead of just a vegetable pasta dish and a sorbet. Do you have a favourite brand or product, and why? I really love New Roots vegan cheese, as I think the traditional production methods create something really special. It is cheese, just made from nut milk instead of animal milk, so no living being had to suffer for it. I could eat it all day long. Plant-based milks have been taking over in 2017/18. Do you see this happening in any other areas? For example, will people ever favour vegan cheese over dairy? Violife has been a real game changer in the market, and the prevalence of supermarket own-brand vegan cheeses is a real indicator of progress here. This area is ripe for more innovation, and it’ll be exciting to see how it develops. Vegan food seems to be growing every day at an incredible rate and is now relatively mainstream. How do you picture the future of our movement? Every day, we see new product launches and astonishing news stories about the rise of vegan living, but there’s still much to do. Most people still think it’s OK to pay for animals to be killed and to eat their flesh, milk, and eggs. Times are changing, of course, but we must continue to push for progress every day. We must never miss an opportunity to speak up for animals – to suggest a compassionate choice or offer a vegan version. The ripple effect of each small act of kindness could be enormous, and animals need our help. Which categories seem to be saturated or otherwise? If a vegan entrepreneur wanted to start a new business now – which areas would you say are a safe bet? If the product is good, bring it on. Just when I think the market can’t take another plant milk launch, boom! One comes along and is a big hit with consumers.